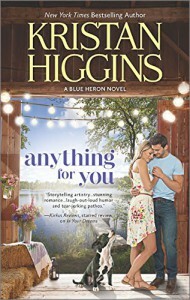 When it comes to series like Blue Heron and others one would read in the HQN line, I find if the characters are strong and likable and the setting has appeal it's worth to read the next one and see where the overall story takes you. Like with Brenda Novak's Whiskey Creek stories, I've had issues with some books here, but I enjoyed Anything For You, more so than book 4. It's been a while since I read the last story, but book 5 brings us to restaurateur Connor and Jessica, who managed to cross the wrong side of the tracks to a respectable position in town...though some people haven't let her forget her past. After weaving through their backstory - flashbacks interspersed with current action we learn of Jessica's reluctance to have a long-term relationship with Connor - family issues and emotional baggage prevent her from opening up to him. Connor's stubborn nature can't wear her down, though it's not until they stop tip-toeing around issues that Jessica realizes she can have love. I think this series could keep getting better if Higgins continues it. If not, AFY is a great place to leave Blue Heron, happily.